Did Prehistoric People Watch the Stars Through This 6,000 Year Old 'Telescope'? Prehistoric humans may have observed the sky via primitive lens-less “telescopes”, according to a team of British astronomers who have studied the long passageways of ancient megalithic tombs. The details were presented today by Kieran Simcox, a student at Nottingham Trent University, at a meeting of the Royal Astronomical Society. Technically it’s not a telescope (with or without a lens), per se. According to Simcox, it’s more like a very primitive version of a camera obscura, the basic concept behind the pinhole camera. All you need to create a camera obscura is a small hole in a shade or a wall, so that light can pass from a sunlit garden, for instance, into a darkened room, projecting an inverted image on the wall opposite the pinhole. Dolmen da Orca, a typical structure in Western Iberia, part of the megalithic cluster of Carregal do Sal. The key difference with the megalithic clusters is that the narrow entrance creates an aperture of about 10 degrees, sufficiently restricting the view by naked eye to make it easier to observe the sky – specifically, certain stars — during pre-dawn and twilight hours. Simcox and his colleagues are exploring the precise conditions under which this might work in the laboratory. Is it just a question of eye adaptation, or do other factors, like the size of the aperture or background colour of the sky, play a role? (Left) The “window of visibility” while standing in the dolmens’ chamber. 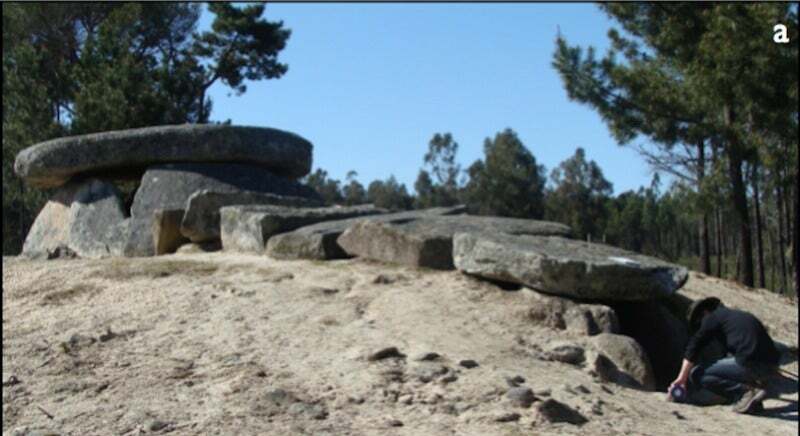 (Right) Orca de Santo Tisco, a dolmen with a much smaller passage. It’s always a tricky proposition to speculate about how such ancient structures may have been used by prehistoric peoples. But Simcox et al’s work is based on an earlier pilot project focusing on passage graves in Carregal do Sal in Portugal. That yielded a new way of identifying alignments between how the passages and entrances of the prehistoric are oriented, and celestial objects. Based on this, Silva said that the mostly likely target would be the star Aldebaran. “From the wider archaeological record connected to the societies that built the passage graves, we know that these were pastoral communities, that still practised hunting and gathering,” he said. Such communities would pass the colder winter months in river valleys (where the dolmens are located) and move to higher ground in the spring—most likely to Serra da Estrela (“mountain range of the star”). Six thousand years ago, people would have been able to see Aldebaran’s first rise at dawn in late April or early May. Silva thinks this suggests those communities may have relied on such observations to tell them when it was time to move to higher pastures. However, it could also be the case that such sites were used in initiation rituals, similar to the ritual use of caves in Mediterranean regions during the Neolithic era. “When the youth would hit a certain age, they would be shown this ‘special’ way of viewing a star before it would usually be visible,” Simcox said.